Continuing their weekly media updates, BioWare Austin fills in players on the newly revealed Trooper class for their upcoming Star Wars MMO The Old Republic. 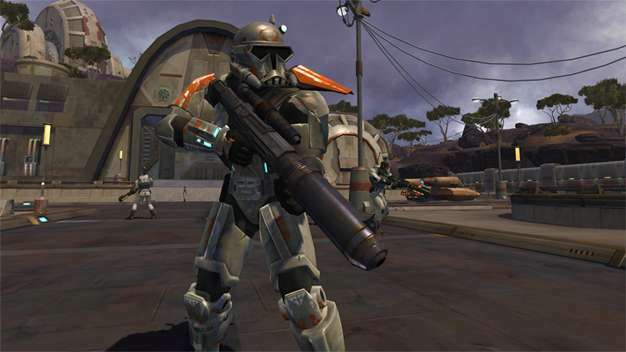 Differing from their Force-sensitive allies and their Bounty Hunter counter-parts, the Trooper is described as the Galactic Republic’s other line of defense which has now been promoted to the only line of defense seeing as how the Knights of the Republic had to relocate to their planet of origin, Tython. What would make you want to play a Trooper? Big guns, heavy armor and sticky grenades. Yes, there’s that whole “defend the Republic or it gets destroyed,” thing but defending stuff doesn’t get things blown up.